I came here during an afternoon of bar-hopping on a rare Friday off from work. We were hungry, and I saw the words “veggie burger” on the menu so although I didn’t have high hopes I went ahead and ordered it. And it was pretty much the exact level of mediocrity that you would expect to find at the average bar or pub. The patty was a generic pre-made one but it was a step above some of the worst pre-made patties I have had the misfortune of eating - and at least they cooked it all the way through. 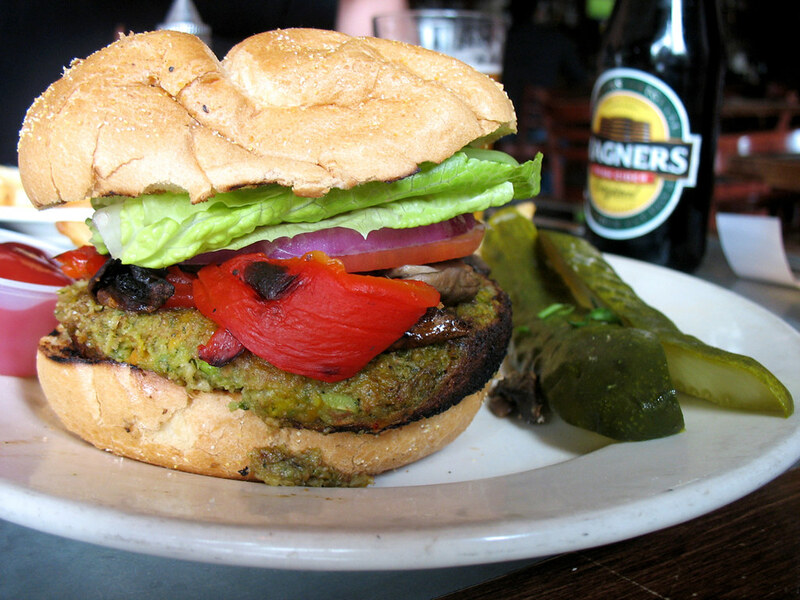 The toppings were the best part – along with the standard lettuce/tomato/onion, the burger was covered with roasted red peppers and mushrooms. I don’t care for mushrooms at all (I know, that’s weird to hear a vegetarian say, right?) but they were easy to pick off of the burger before I ate it. I am of the opinion that roasted red peppers improve almost everything they touch, and that certainly held true in this instance. The bun was a big disappointment though – rather stale and tasteless. My carnivorous friend had ordered a pulled pork sandwich and his was served on the same disappointing bread as well. The sides of fries that were included were nothing special either. Was it good enough to refuel us for an evening of continued bar-hopping? Yes. Would I ever go back and order it again? Not unless I was drunk and too hungry to walk another block or two in search of something better. I still claim that it is not weird for vegetarians or vegans to not eat mushrooms. Mushrooms are fungi, not vegetables.